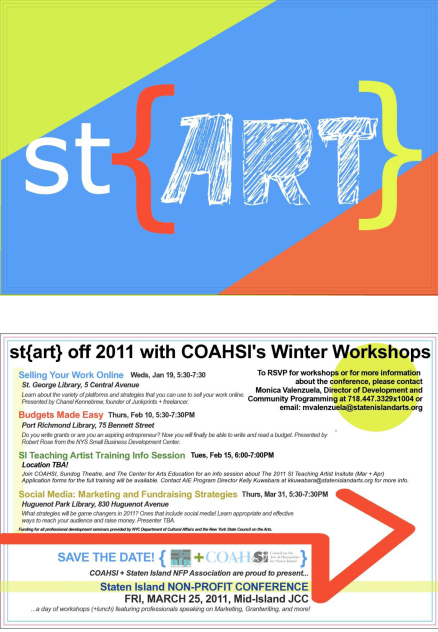 On Wednesday, January 19, 2011, I will be presenting a workshop called "Selling Your Work Online" with the Council on the Arts & Humanities for Staten Island (COAHSI) at the St. George Library on 5th Central Avenue from 5:30 pm-7:30 pm. Come learn about the variety of platforms and strategies that you can use to sell your work online. To RSVP for the workshop, please contact Monica Valenzuela, Director of Development and Community Programming at (718) 447-3329x1004 or email: mvalenzuela@statenislandarts.org. See you there!